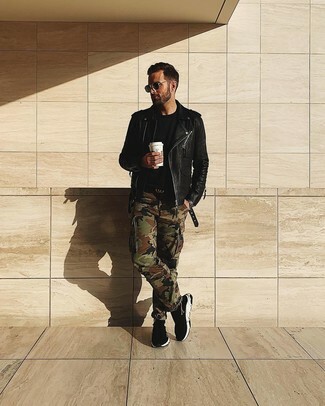 If you're scouting for a bold casual yet seriously stylish ensemble, try pairing a black leather biker jacket with olive camouflage cargo pants. Let your outfit coordination savvy really shine by finishing with rag & bone black high top sneakers. Infuse a touch of relaxed elegance into your day-to-day wardrobe with a charcoal overcoat and navy jeans. A trendy pair of rag & bone Flynn High Top Sneakers is a simple way to transform this outfit. 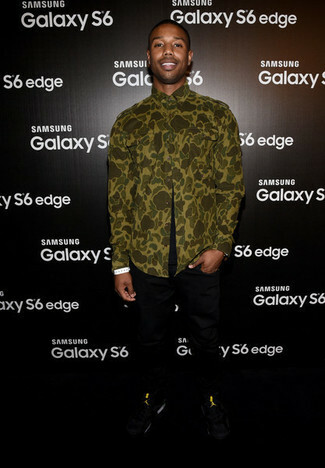 If you're in search of a laid-back but also on-trend outfit, opt for an olive camouflage long sleeve shirt and black jeans. 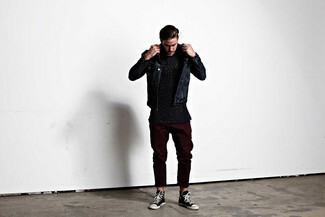 Inject a more laid-back finish into this look by rocking black high top sneakers. One of the coolest ways for a man to style a black leather bomber jacket is to combine it with dark purple chinos for a casual ensemble. 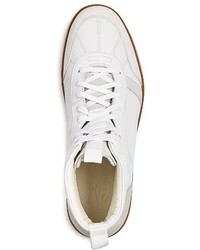 Go for rag & bone Flynn High Top Sneakers from Bloomingdale's to bring an air of stylish effortlessness to your look. A black denim jacket and burgundy chinos are true menswear essentials if you're piecing together an off-duty wardrobe that holds to the highest style standards. 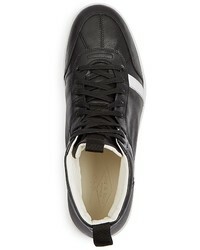 Rag & bone black high top sneakers will add a more relaxed spin to an otherwise all-too-safe ensemble. 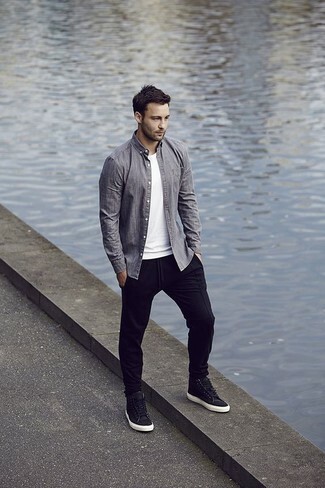 To achieve a casual ensemble with a fashionable spin, rock a grey long sleeve shirt with black sweatpants. Showcase your fun side by finishing with a pair of rag & bone black high top sneakers. Wear a camel overcoat with black skinny jeans to put together a truly dapper and current casual outfit. Why not complete this look with rag & bone Flynn High Top Sneakers for a more laid-back touch? 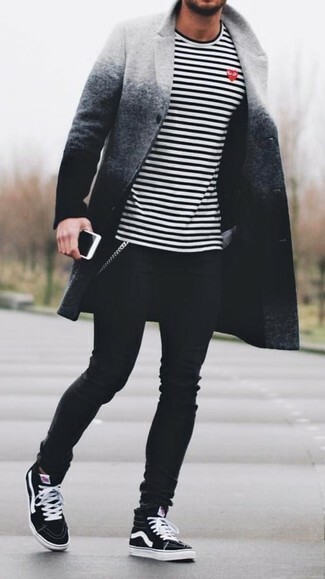 Try teaming a grey ombre overcoat with black skinny jeans to pull together a cool and casual outfit. 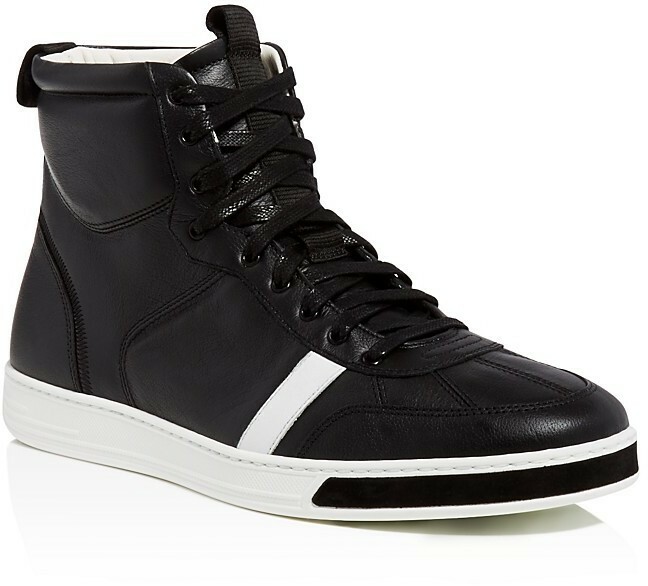 Send an otherwise mostly dressed-up ensemble a whole other path by wearing rag & bone Flynn High Top Sneakers. A charcoal wool blazer and blue jeans are among those versatile items that have become the key elements in any modern gent's closet. Dial down the dressiness of your look by rounding off with a pair of rag & bone Flynn High Top Sneakers.